Picture a sunny bright Sunday morning, the family is coming over at the last minute, and you haven't gone grocery shopping in a week... What do you do? Panic? Yeah me too! Then after a cup of coffee and a conversation with a good Friend I calm down and can finally think about a menu plan that doesn't require me running out to the store. This such occurrence happened just about a week ago, Let me explain. My hubby and I invited my In Laws over for "Lunch" on a Sunday after church, just Mom and Dad, but it was last minute. Now normally this doesn't really bother me, but this particular week had been slightly stressful for me, and I was hoping to take a nap that Saturday afternoon when we invited them over. Then suddenly I was running around like a crazy person realizing I didn't have much food in the house! Eventually I calmed down, called a good friend in a panic, then called my Mom In Law and came up with a plan of action. Brunch instead of Lunch. Now THAT I could do! Suddenly I was relieved, and looking forward to trying out 2 new recipes! I was slightly hesitant, as we all are whenever we're experimenting with a new recipe, but as soon as I saw everyone had gone for seconds of everything I knew I had something good! 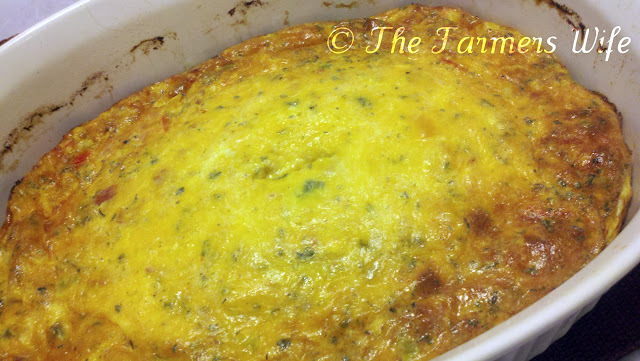 This Egg Casserole was SO easy, and delightfully delicious. Next time your in a panic for a "Brunch" meal, give this a try! In a frying pan, heat the olive oil then add the ham, onions, tomato and bell pepper. Saute until the ham is slightly browned and the veggies are soft and fragrant. Remove from the heat and set aside. Grease a casserole dish and preheat the oven to 350F degrees. In a large bowl crack the eggs, and whisk until combined and frothy. Add the sour cream, milk, spices and 1 1/2 cups of cheese, and whisk to combine. Add in the ham and veggie mixture, then pour into the prepared casserole dish. Cover with foil and bake for 30 minutes. After 30 minutes, remove the foil and add the remaining cheese. Bake uncovered another 30 minutes until golden around the edges and the center is firm. Remove from the oven and let cool about 10 minutes, the eggs will deflate a bit. Serve warm. I will admit I was nervous about this dish. This was completely by the seat of my pants kind of recipe and I literally had no fall back! And yet it was amazing! When my In Laws and Hubby took seconds, and my little Sous Chef ate his whole serving I knew I had a hit on my hands! 5 stars. Today is the LAST chance to enter the Giveaway! You have until Midnight Mt. Time so hurry on over! Nice brunch idea... looks fulfilling too, the guys are sure to like it with all the eggs. Great work! Perfect use of items you already have on hand. Looks yummy. This is a great one dish meal and I would not mind it on my plate for any meal time. Yummy recipe, you did a great job in spite of the state of panic. Thanks for sharing. Looks like a great egg brunch! Great job on your last minute idea! That sounds like a great breakfast/brunch meal. I bet the sour cream gave it a nice creamy texture. What a great recipe Kim..I love it, and can't wait to try it soon! This looks amazing!!! Must try it! Soon. This is exactly the sort of dish I like to make for my inlaws! It sounds fabulous! Thanks so much! I plan on making this Christmas morning.